VIDEO: Scientology’s dramatic retaliation to Louis Theroux’s new documentary. Today Tonight story by Bryan Seymour. Video at link below. The movie gets 3 1/2 stars. While Rathbun is well-known around the world as an outspoken critic of Scientology — and has participated in many docos and TV programs in the past — his own complicity in some very unsavoury incidents in the past remains open to question. To his credit, Theroux keeps pressing Rathbun with that question, and his angry responses point My Scientology in yet another intriguing direction. It can sometimes be amusing viewing, but like Theroux’s finest TV work, it is always both revealing and disturbing in equal measure. I just got back from seeing the movie. I loved it! I laughed a lot (mostly because there was some funny scenes, but also because I was embarrassed that I ever yelled at an ashtray). I think I understand why Marty has lost the plot. He does not come off well in this movie. It's hard to say anything here because I don't want to spoil it for you guys who have yet to see it. All I can say is to do yourselves a favour & go out for a "date night" with the spouse & have a good laugh. I would like it if you would say more, because it's going to be a while before those of us in the US will be able to see it. Ok, when I get home tonight I'll put up a post with lots of Spoiler warnings so people can skip the thread. You were embarrassed? What about the ashtray? Try as it could, it couldn't stand up. Can you imagine how demoralized it felt? Day after day it just sat there. Occasionally a student took pity on it and put it on a chair and off and on lifted it into the air. Can you imagine how much at effect it felt? People yelling at it, moving it around without so much as a single "can you help me improve my intention?" Or the slightest expression of affinity for a job well done? VIDEO: Steven Mango responds to Marty Rathbun's allegations about Louis Theroux’s movie re: Scientology. I expose the truth behind what happened on set between Marty Rathbun and the BBC on the film set of My Scientology Movie. In My Scientology Movie, I discuss my story, as well as performed in reenactment scenes of experiences of others within the Church. Marty Rathbun posted a blog discrediting the BBC and My Scientology Movie. However, I was on set with Marty and I tell the truth of how it was actually working on set with Mr. Rathbun. Thanks Steven. You pretty ably and thoroughly confirmed the point I was trying to make in the paragraph at issue. I think if anyone tunes out all the TO innuendo and reads that paragraph carefully and watches Steven's video carefully, they will come to a similar conclusion. In either event, it was a pleasure spending time with you in LA (sorry that my personality deficiencies didn't seem to make it so for you). You gotta wonder what reality Marty is living in. It's almost like there is a total disconnect from the reality we are in and the one Marty is in. Gotta wonder why Steve doesn't get the same pit bull attack from Marty that everyone else in the "ASC" is getting? Maybe he realizes that a witness from the set speaking out endangers his narrative. 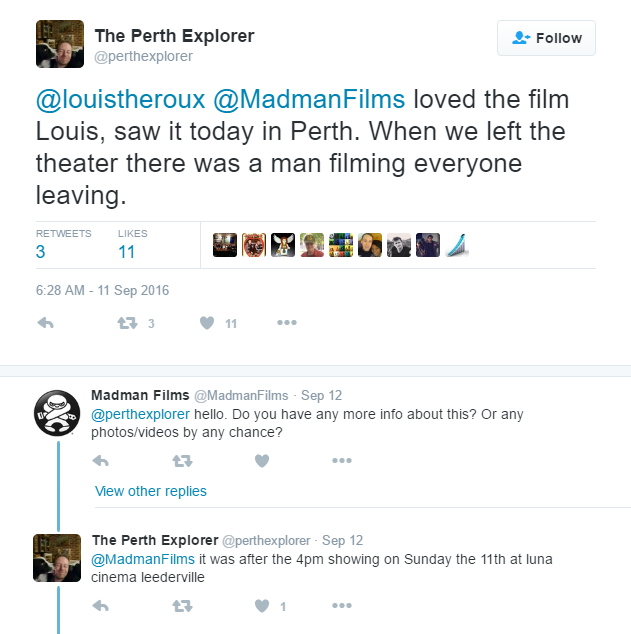 People who saw Louis Theroux's My Scientology Movie were filmed after they left the theater. How can they still be this stupid? I just checked the Program for the Port Townsend Film Festival, and discovered that "MY Scientology Movie" was no longer scheduled for Sunday night. I called them up and I was told that the Film had been cancelled. That it was pulled by Magnolia Pictures, the Distributor. That the Film had been pulled from all the Theaters. WTF!!! Re: the Fookers Cancelled It! Businesses are averse to threats, particularly from people with a history of carrying out their threats. They have just cancelled " My Scientology Movie" from the Port Townsend Film Festival. It was to be shown Sunday nite. I looked at the Program on the Web to check the time and it was no longer on the program. So I called and the Lady said that it had been cancelled. Cancelled by the Distributor, Magnolia Pictures. Cancelled in all the Festivals and Theaters. I'm old and a tad senile, but I keep thinking Litigation???? marty marty marty.....??????? ANSWER: Because they still are that stupid. The answer seems flippant but it's paradoxical--considering the last 66 years of bragging that scientologists have done about their advanced technology, superior knowingness and paranormal powers. While religiously following Hubbard's PR tech that fails with disastrous results at every turn, scientologists will nonetheless proudly declare unprecedented wins; because. . .
the ability to [STRIKE]make[/STRIKE] fake it [STRIKE]go[/STRIKE] going right. Confirmation the Port Townsend Film Festival has cancelled and replaced My Scientology Movie. Further confirmation the Port Townsend Film Festival has cancelled and replaced My Scientology Movie. 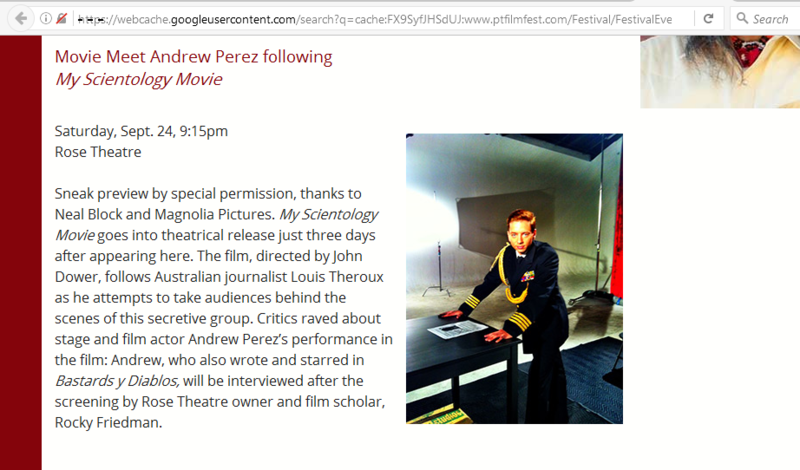 The Google cached version of the festival's Events page lists "Movie Meet Andrew Perez following My Scientology Movie." The current version of the page omits that event. 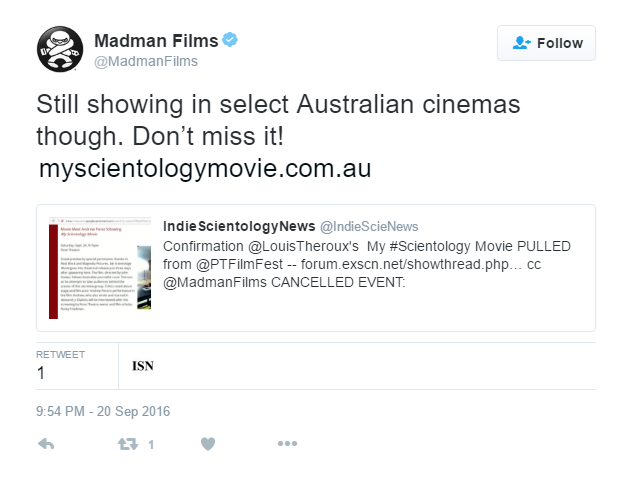 Madman films responds by effectively confirming the cancellation but stating the movie is "still showing in select Australian cinemas."